In this study, the effect of production parameters (G number, casting atmosphere, and cooling rate) on secondary dendrite arm spacing (SDAS) and estimation of cooling rate by SDAS in functionally graded Al-Cu eutectic alloy are investigated. Functionally graded Al-Cu eutectic alloy is fabricated by centrifugal casting method. Different productions are carried out by changing cooling rate, G number and casting atmosphere. Cooling rate is controlled by a novel mold design and 0,09 K/s, 1,04 K/s, 1,96 K/s and 2,82 K/s cooling rates are obtained by using this mold. 10, 20 and 30 G numbers are obtained by changing the mold rotation speed. Air and 200 mBar vacuum atmospheres are preferred as casting atmospheres. SDASs are measured by Leica Application Suite V 4.6 image analysis software. Apparent interlamellar spacing is used in measurements. It is found that cooling rate alteration has a significant influence on SDAS. In addition to this, G number and casting atmosphere affected the SDAS by affecting the cooling rate. SDAS increased with the decreasing of cooling rate. Successful results are obtained in cooling rate estimation. S. M.  M. M. Rahvard, M. Tamizifar, S. M. A. Boutorabi, and S. G. Shiri, “Characterization of the graded distribution of primary particles and wear behavior in the A390 alloy ring with various Mg contents fabricated by centrifugal casting,” Materials and Design, vol. 56, pp. 105-114, 2014. X. Lin, C. Liu, and H. Xiao, “Fabrication of Al-Si-Mg functionally graded materials tube reinforced with in situ Si/Mg2Si particles by centrifugal casting,” Composites: Part B, vol. 45, pp. 8-21, 2013. P. Shailesh, S. Sundarrajan, and M. Komaraiah, “Optimization of process parameters of Al-Si alloy by centrifugal technique using Taguchi design of experiments,” Procedia Materials Science, vol. 6, pp. 812-820, 2014. G. Chirita, I. Stefanescu, D.Cruz, D. Soares, and F. S. Silva, “Sensitivity of different Al-Si alloys to centrifugal casting effect,” Materials and Design, vol. 31, pp. 2867-2877, 2010. M. Ş. Turhal and T. Savaşkan, “Relationships Between Secondary Dendrite Arm Spacing and Mechanical Properties of Zn-40Al-Cu Alloys,” Journal of Materials Science, vol. 38, pp. 2639-2646, 2003. Y. Çengel, Introduction to Thermodynamics and Heat Transfer (2nd Ed. ), USA: McGraw-Hill Primis, 2008. J. A. Vargas, J. E. Torres, J. A. Pacheco, and R. J. Hernandez, “Analysis of heat input effect on the mechanical properties of Al-6061-T6 alloy weld joints,” Materials and Design, vol. 52, pp. 556-564, 2013. S. Ağca and N. Akar, “Santrifüj Döküm Yöntemiyle Üretilen Al-Cu Fonksiyonel Derecelenmiş Malzemelerde Üretim Parametrelerinin Malzemenin Sertliği Üzerine Etkisi,” Politeknik Dergisi, vol. 20(1), pp. 121-127, 2017. A. Czarski and P. Matusiewicz, “Some aspects of estimation accuracy of mean true interlamelar spacing,” Metallurgy and Foundry Engineering, vol. 38(2), pp. 133-140, 2012. T. Koziel, P. Matusiewicz, M. Kopyscianski, and A. Zielinska-Lipiec, “Estimation of the cooling rate in 3 mm suction-cast rods based on the microstructural features,” Metallurgy and Foundry Engineering, vol. 39(2), pp. 7-14, 2013. N. Akar, K. Boran, and B. Hozikliğil, “Effect of mold temperature on heat transfer coefficient at casting-mold interface,” Journal of the Faculty of Engineering & Architecture of Gazi University, vol. 28(2), pp. 275-282, 2013. ISNAD Ağca, Semih . "The Effect of Production Parameters on Secondary Dendrite Arm Spacing (SDAS) and Estimation of Cooling Rate by SDAS in Functionally Graded Al-Cu Eutectic Alloy". 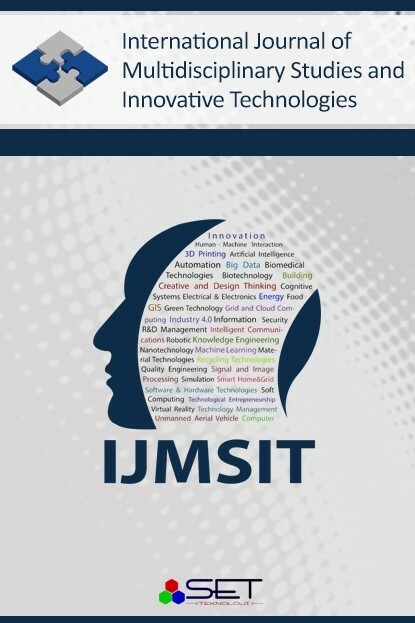 International Journal of Multidisciplinary Studies and Innovative Technologies 1 / 1 (November 2017): 36-41.